The ‘extremely high’ electricity rates on Block Island will help absorb much of the project’s 250 million dollar cost, said Jesse Broehl, a senior research analyst at Navigant Research in Boulder, Colorado. 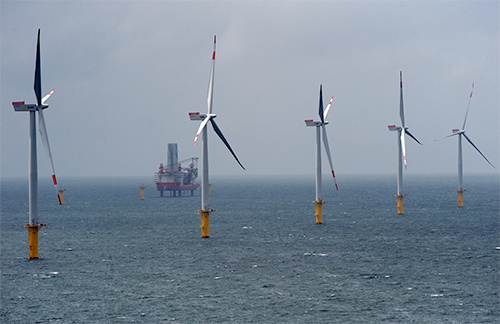 The econoics work because of “high energy demand and high-priced electricity coincident with strong offshore wind resources along the eastern seaboard,” Broehl said. NORTH KINGSTOWN, R.I. — Construction has begun off Rhode Island’s coast on the nation’s first offshore wind farm, a milestone that federal and state officials say will help the fledgling U.S. industry surge ahead. U.S. Secretary of the Interior Sally Jewell said Monday that lenders, regulators and stakeholders can now see a path forward. The potential for offshore wind power generation in the U.S. is staggering. At a projected 4,223 gigawatts (GW) of electric generating potential (with the Ohio waters of Lake Erie alone accounting for more than 50 GW of that power), offshore wind offers a viable, untapped opportunity for large-scale clean energy projects that produce zero emissions in operation, consume no water, and displace the generation from some of our nation’s dirtiest power plants.